Fiddler's Green is an intimate 55+ community located in Norman, Oklahoma. With just 58 single-family homes, Fiddler's Green is a terrific option for active adults and retirees who want a close-knit atmosphere while being in proximity to big city attractions. With amenities meant to bring neighbors together, Fiddler's Green is perfect for homeowners who place a premium on community and a low-maintenance lifestyle. At the heart of the neighborhood is the community center. The meeting rooms are great for pursuing hobbies or for neighborhood get-togethers while a catering kitchen is on hand for sharing a meal with friends. Outdoors, residents can take advantage of the pool during the warmer months by either taking in a few early morning laps or lounging on the outdoor patio. For an invigorating workout, residents can go for a run along the community's walking and biking trails. Developed by Riverchase Development Corporation, Fiddler's Green offers five separate floor plans that are now available on a resale-only basis. These models range in size from approximately 1,400 to over 1,600 square feet and offer two or three bedrooms, two bathrooms, and an attached two-car garage. Some homes offer a den, open floor plans, and plantation shutters. Living within Fiddler's Green means enjoying a low-maintenance lifestyle in the company of friends and neighbors. Because of its intimate size, Fiddler's Green is a terrific place for empty nesters seeking to form friendships with like-minded neighbors. Residents will also have more time to enjoy everything the community has to offer thanks to the homeowners' association fee that covers yard maintenance. 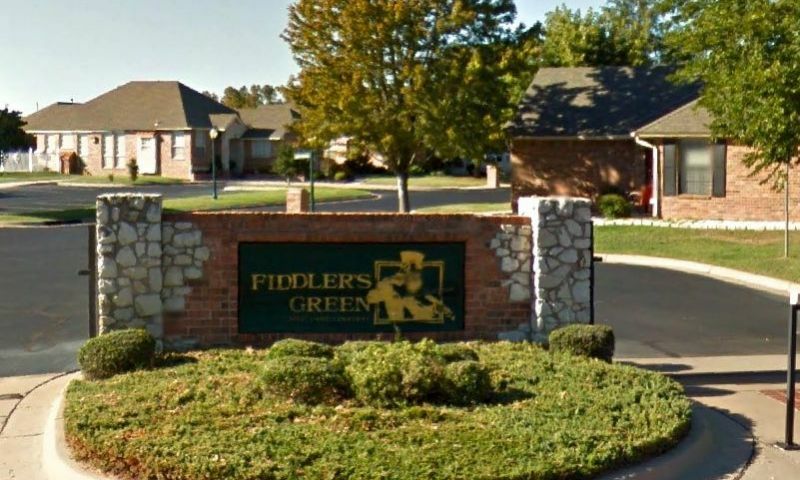 Fiddler's Green is located in Norman, Oklahoma, which is about 25 miles from Oklahoma City. Sooner Mall is less than five miles away, while a Sam's Club, Aldi, Wal-Mart and a collection of boutique grocery stores are just a quick drive down the street. Less than five miles to the north is the Norman Regional Hospital. For farther travel, Will Rogers World Airport in Oklahoma City is just 25 miles from the community. Golf enthusiasts will also delight in the 18-hole Trails Golf Club that is just down the street from the community gates. Norman is home to an art and natural history museum as well as Lake Thunderbird State Park and three casinos. For big-city entertainment, Oklahoma City has several restaurants, museums, sports stadiums and nature centers. Active adults in Norman, Oklahoma will love the close-knit atmosphere and lovely homes within Fiddler's Green. Check back soon for more information on the lifestyle in Fiddler's Green. Fiddler's Green offered five separate floor plans that are now available on a resale-only basis. These models range in size from approximately 1,400 to over 1,600 square feet and offer two or three bedrooms, two bathrooms, and an attached two-car garage. Some homes offer a den, open floor plans, and plantation shutters. Please Note: Floor plans are not available at this time. My mom has lived there for about 6 years. We live close by so it was a great choice for us. She has plenty of friends and is active with all the neighborhood activities. The Rivermont Retirement Community is next door and they are very friendly with all there activities. Is been a wonderful choice for us and for anybody wanting a safe place for parents. It is a gated community. Homes sell fast so they appreciate nicely. Fiddler's Green is a very nice neighborhood and enjoyed visiting very much. There is a small clubhouse with a pool and it is gated. Most importantly, it is walking distance from a Rudy's! 55places.com is not affiliated with the developer(s) or homeowners association of Fiddler's Green. The information you submit is distributed to a 55places.com Partner Agent, who is a licensed real estate agent. The information regarding Fiddler's Green has not been verified or approved by the developer or homeowners association. Please verify all information prior to purchasing. 55places.com is not responsible for any errors regarding the information displayed on this website.